This tutorial/article is going to be somewhat underdeveloped and possibly even wrong sometimes, but I've been asked to explain this twice and I know a lot of people have trouble with it. Please leave questions and clarifications in the comments and they may be incorporated into the copy. To get the most use out of this tutorial, you will need to attempt to understand the math concepts and shapes behind it, NOT just the specific code. By copying without understanding, you do not learn. It should help answer questions like: (Movement Section) How do I get a sprite to follow the player? How do I move a bullet at an angle? (Smoothing Section) What can I do to improve the aesthetic quality of my game? How can I smoothly interpolate between two values? Why radians? (General) What is SIN() useful for? How does this crap even work? My teacher didn't teach well Why everything gotta cost radians? You're probably here because, like I got in middle school, your education (or future education on) trigonometry consisted of definitions and memorization, and you know there's SOMETHING about angles that you need to work with in your game but you don't really get it. Trigonometry is a scary word that means "math about angles and triangles." All of the useful stuff we can do with it regarding movement is based on this concept of the "unit circle," a circle with a radius of 1 unit centered around the origin (the point (0,0) on a coordinate system). Angles are counted counter-clockwise. "All the way left" is (-1,0) on this circle (180 degrees) "All the way right" is (1,0) (0° or 360°), and similarly for up and down, (0,1) (90°) and (0,-1) (270°), respectively. But what about points in non-cardinal directions? Like 45 degrees? Well, let's consider the "radius" of the circle as the hypotenuse of a triangle. We actually know the length of the hypotenuse, since the circle has a radius of 1. But what's so useful about that? Actually, the interesting part is the other two sides. 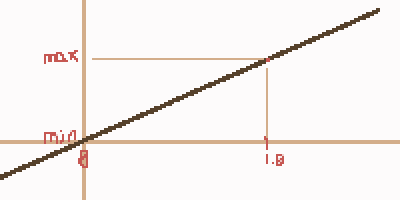 You'll notice they're perpendicular and axis-aligned, which doesn't seem important, but consider that it doesn't form a bad triangle like this one: :( Anyway, the length of sides can be calculated with sine and cosine. If you remember, the sine of an angle is the ratio between the opposite side and the hypotenuse, and the cosine is the ratio between the adjacent side and the hypotenuse. Since the hypotenuse is always 1 on the unit circle, we're effectively calculating b and h! So the sine of angle θ (theta) is b and the cosine of angle θ is h. In SmileBASIC, that looks like this: VAR ANG = RAD(90) 'SIN() and COS() take "radians," 'we have to transform our angle in degrees 'to radians with RAD() ?SIN(ANG) ' 1 ?COS(ANG) ' 0 Remember that 90° is perfectly north on the circle, a Y-offset of 1 and an X-offset of 0. That's right. 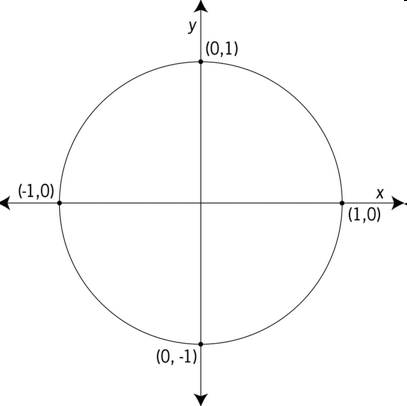 SIN() gives us the Y component of an angle, and COS() gives us the X component. Now it's starting to make sense why we'd want this, right? "But Miss Yuuka," you say, "how do we find the angle?" Introducing: arctangent! Arctan, or ATAN actually has two modes in SmileBASIC, but the one we like is the second form ATAN (2): Returns the arc tangent value (from XY-coordinates) Variable = ATAN( Y-coordinate,X-coordinate ) Given two coordinates relative to the origin (0,0), ATAN gives us the angle of the slope (which you might remember as being y/x) of that point from the origin. Let's apply that to a VERY real scenario that I'm sure you have all encountered. the angery [sic] blob wants to attack the happy blob, but it doesn't know how to move. In this case, we want to consider the angery blob's position as the origin, and the happy blob a target point. If we want to find that angle, we'll have to transform the happy blob's coordinates (which are now in the SB screen coordinate system) into a new coordinate system centered around the ANGERY blob. And creating a new coordinate system takes a lot of work! No. Not really. C_X = TARGET_X - ENEMY_X C_Y = TARGET_Y - ENEMY_Y All we do is find the difference between the points. In fact, we're calculating the lengths of the legs of the triangle right now, so why bother with ATAN or any of that? Because if we used these distances, we'd jump right to the other blob! We have to normalize them to a travel distance of exactly 1... just like that unit circle we had earlier. So given these distances, we can plug them into ATAN to get the angle (in radians), and then from there, use SIN and COS to get the horizontal and vertical components of our movement. 'remember, Y comes first ANG = ATAN(C_Y, C_X) STEP = 1 ' distance to move, "speed" if you want ENEMY_X = ENEMY_X + COS(ANG) * STEP ENEMY_Y = ENEMY_Y + SIN(ANG) * STEP If we had this in a real loop with SPOFS, the "enemy" would chase the player around. Here's a full example where a sprite shoots something at you (without collision or anything) SPSET 0,84 SPSET 1,5 VAR X, Y, DX, DY, EX=200, EY=120, BX, BY, ANG SPOFS 1, EX, EY WHILE 1 'player movement STICK OUT DX,DY INC X, DX*2 DEC Y, DY*2 SPOFS 0,X,Y 'the relevant part IF !SPUSED(2) THEN 'keep shooting, see L27 SPSET 2, 257 SPOFS 2, EX, EY ANG = ATAN(Y - EY, X - EX) 'get angle from difference in position 'but calculate it once; this is a bullet ENDIF SPOFS 2 OUT BX, BY 'get current coordinates 'get horizontal part with COS BX = BX + 5 * COS(ANG) ' *5 for SPEEEED 'get vertical part with SIN BY = BY + 5 * SIN(ANG) SPOFS 2, BX, BY IF SQR(POW(BX,2)+POW(BY,2)) > 512 THEN SPCLR 2 'destroy it after it goes far enough VSYNC WEND That's about it. In Section 2 we exploited one characteristic of the unit circle, its unit radius, to move a sprite based on a given angle. Here we'll exploit another property: it's a circle! If we were to move, say, 10 degrees from 0, what would the change in vertical position (or Δsin(θ)) be? hmm. Though it doesn't matter what in particular the value is, let's calculate it in SmileBASIC: ?SIN(RAD(10)) - SIN(RAD(0)) 0.17364818 OK But since it's a circle, the arc (a section of a circle) at the "top" should have less vertical change in the same 10 degrees. Let's test (recall that the top of the circle is 90 degrees): ?SIN(RAD(90)) - SIN(RAD(80)) 0.01519225 OK That's almost a tenth less vertical change than the first 10 degrees! 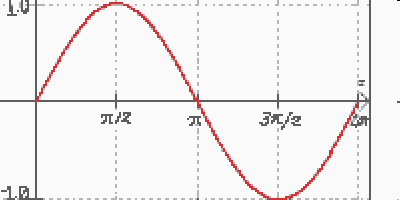 Okay now check out this graph of of sine: This is just a graph of the values of sin(x) for x = 0° to x = 360°. Kinda makes sense, doesn't it? First it goes up, then comes back down, down into negative values after 180°, and back to 0. Sine is a periodic function: that is, it repeats after a certain interval. Specifically, the period of sine is 2π radians. The general form of sine is Asin((2πk)x + c) + h < to be continded Sorry for crappy tutorial. If I forgot anything leave a comment and I might be able to fill it in. 15 Comment(s) ProKuku QSP Contest 1 Contest Participant I participated in the first SmileBASIC Source QSP Contest! Edited 10 months ago “< to be continded” *six months later* Hmmm Yttria Head Admin 10 months ago I kept beginning to write and then discarding the drafts. I'm not really even sure how best to present this any more... transformations in particular are better to be interactive. I haven't forgotten about it, though. auceps 3 months ago 6 months later (has forgotten) Minxrod Third Year My account is over 3 years old Website Expert Programmer Programming no longer gives me any trouble. Come to me for help, if you like! Programming Strength Video Games I like to play video games! Hobbies 1 year ago "trigonometry is a scary word" What? Trigonometry isn't a scary word. Other than that good tutorial probably, I only skimmed it. :P Yttria Head Admin 1 year ago Any word with more than three syllables can be effectively used to deter small children and rodents. snail_ QSP Contest 1 Contest Participant I participated in the first SmileBASIC Source QSP Contest! Helper Received for being very helpful around SmileBASIC Source Achievements Amazing Contributor Someone thinks I'm an awesome person who has done so much for the community! Achievements 1 year ago i love the unit circle auceps 1 year ago I learned about the magic of the unit circle a few weeks back when I finally decided to see what was with those sin and cos functions. I can't really say that I'll ever learn it more effectively in school. Math teachers change the definitions to fit their curriculum, and it totally messed me up on the dang homework they assigned me this night. JohnCorby 1 year ago i accidentally learned all this from a random program i found a while ago mystman12 First Day Joined on the very first day of SmileBASIC Source Website Intermediate Programmer I can make programs, but I still have trouble here and there. Programming Strength Deep Sleep Hidden Website 1 year ago Hmm, this'll be a nice refresher if I need it, thanks! I'm actually finishing a pre-calc class right now so all this is still fresh in my mind. spaceturtles Video Games I like to play video games! Hobbies Avatar Block I didn't change my avatar for 30 days. Website Intermediate Programmer I can make programs, but I still have trouble here and there. Programming Strength 1 year ago "to be continded" 12Me21 Syntax Highlighter Received for creating the code syntax highlighter on SBS Night Person I like the quiet night and sleep late. Express Yourself 1 year ago ?COS(RAD(270)) -0 MasterR3C0RD Helper Received for being very helpful around SmileBASIC Source Achievements Third Year My account is over 3 years old Website osu! Is Awesome! I love osu! Express Yourself 1 year ago SeemsGood SpiderLily Avatar Block I didn't change my avatar for 30 days. Website Avatar Embargo I didn't change my avatar for 90 days Website 1 year ago nice pic at the end there MochaProbably Expert Programmer Programming no longer gives me any trouble. Come to me for help, if you like! Programming Strength Night Person I like the quiet night and sleep late. Express Yourself Drawing I like to draw! Hobbies Edited 1 year ago but how could we use sine to create smooth animations auceps 1 year ago SPROT 0,SIN(MAINCNT/100)*20 You happy now?